The kiting community lost an amazing character on May 4th, 2007. 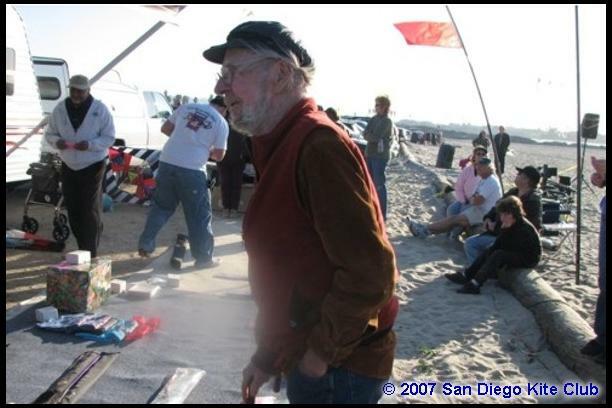 Well known at nearly all the west coast events, Charlie was a longstanding and loyal member of the San Diego Kite Club, an avid sport and fighter kite enthusiast, and he also designed a number of kites including the Solution which was produced by Spectra Sport in the middle and late 90’s. No last name was usually needed, one just had to said “Charlie” and the kiting world pretty much knew it was the self-proclaimed KYTE BUM (as his license plate would state) Charlie M’Clary. 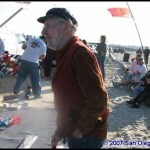 Charlie was one of the founding members of the San Diego Kite Club way back in 1990, his membership number is number 5. He volunteered to hold the position of “Archivest” and he had held that position since the club’s inception. Back then he and his loving wife Joanne lived in Redlands for a period of time. Since their distance from San Diego could have been an issue, they put that to rest almost immediately. At a club board meeting he stated that he and Joanne would do whatever was needed for the club. Eventually they moved to San Diego and called it home. Charlie was a slight man who packed a gravelly yet thunderous voice. 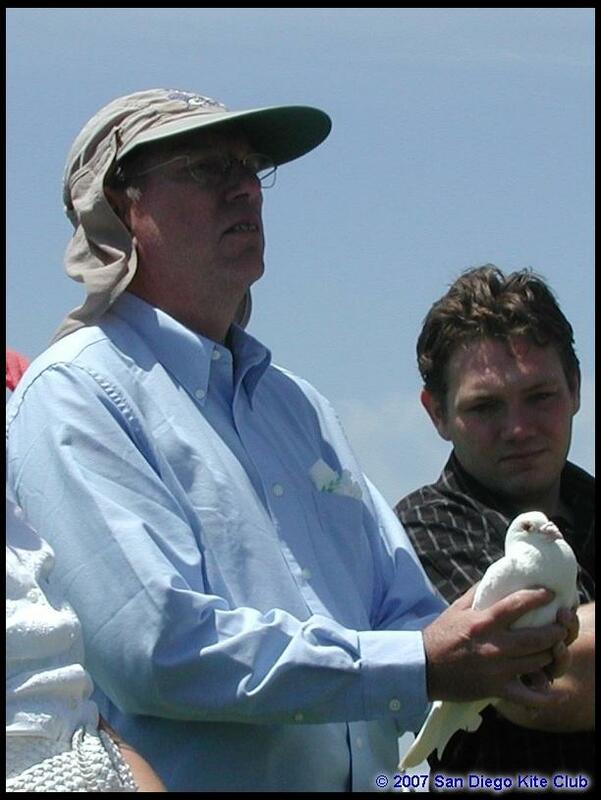 He was quite the character of kiting in Southern California. He always had an opinion about anything kite related. One of my first memories of Charlie was at the 1990 California Open Sport Kite Competition. It was my very first competition and I was so nervous and intimidated by the collection of world class fliers that I was shaking like a leaf. I remember Charlie putting his hand on my shoulder and pumping-up my confidence by stating “… now you and I both know that ‘so-and so’ is going to beat you, right…?” I guess he wanted me to not have any false hopes about competing against the big guys in my debut. Yes, he always had an opinion, sometimes he just needed to work on his delivery- that’s Charlie. 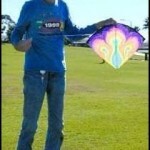 Just about everything in his life revolved around kites. He had designed a number of sport kites and fighter kites. 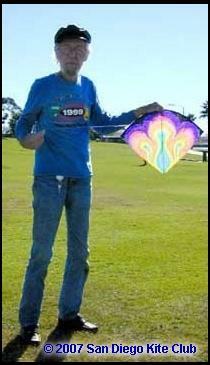 He used to come to my office and ask me to plot out his latest kite design he had done on CAD. Charlie saw himself as a kiting expert and built several kites. In fact, one of his designs was picked up by a commercial manufacturer and was on the market. If he ever saw a newbie struggle he would walk over and offer to help. Anytime a new kite was on the field he would offer his opinion and ways he would improve it. One evening while watching a news magazine story about a man hitch-hiking across the nation, Charlie was this man’s final ride to Santa Monica Beach. Needless to say many of us were surprised when we found a few facts about his past life for the first time on TV. But Charlie lived a full life and enjoyed as much as he could. I know he has traveled far and wide in pursuit of a kiting event. 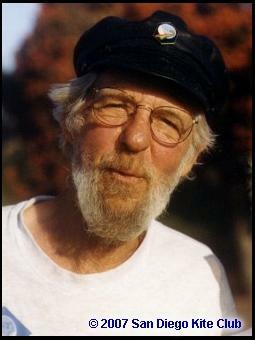 In our club newsletter he wrote a regular column called “Log of the Kyte Bum.” Whether it was our monthly club meetings in San Diego or those in Santa Monica, or any on the West Coast, Charlie made an effort to be there. Its been said that a long life is not necessarily good, but a good life is long enough. Charlie’s life appeared to be both good and long. In the music world there’s several single name personalities: Sting, Madonna, Jewell and Beyonce. In the world of supermodels there’s Iman and Gisele. 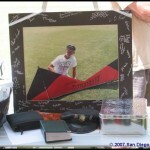 Will share with you some of the details of the Memorial Kite Fly held Saturday, May 4th at Mission Bay Park. The weather was San Diego perfect. People came from long distances. SDKC regularly flies kites in May in memory of flyers from the club that have left empty spaces in the sky. This year the business meeting was suspended. Charlie was the “star” so to speak. A nice potluck was held. The club had ordered white kites but somehow yellow ones were shipped so they flew yellow kites with the name of each person on them. Ron Despojado acted as MC regarding Charlie. I bought little white boxes, used Charlie’s rubber stamp with the fighter kites in which I enclosed 2 of Tom Tinney’s miniature kites-1 moon and 1 sun and gave them to all attending as a memento. 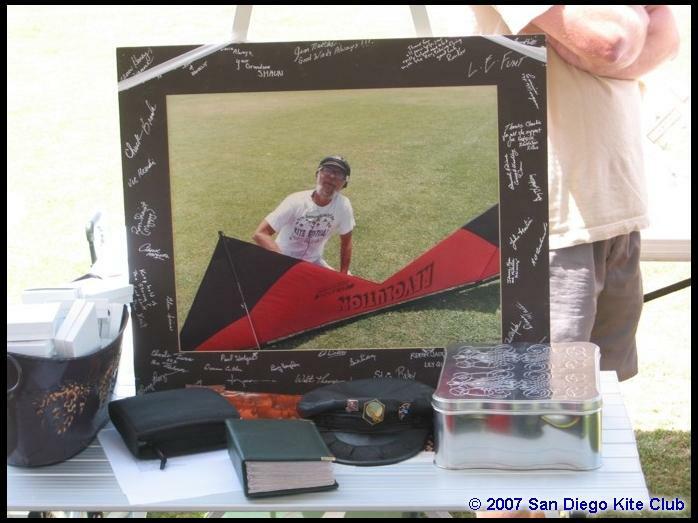 We set a large kite of Charlie on a table along with his cap (which he called his identification), a picture album of Charlie & his kites. We played some of his favorite music on a CD player. The music was as diversified as he was with pieces such as “Walk of Life” by Dire Straits, “Old Time Rock & Roll” by Bob Seger, A Couple More Years” by Dr. Hook, “Green Green Grass of Home” by Burl Ives, “Amazing Grace” by Pete Fountain and a piece that wasn’t exactly a favorite but if you listen to it, it is though he could have written it about his life which is Neil Diamond’s “Hell Yeah”. Someone in the club enlarged a picture of Charlie & me holding hands & sharing a joke which they had everyone sign and then put the glass over it and presented to me. This was in lieu of a book. 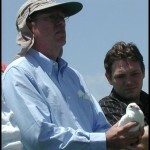 I ordered white doves & each family member said a few words as they released their bird. 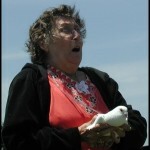 The first one was given to my grandson-in-law and it promptly pooped all over his pants & shoes. This caused everyone to laugh & lent some levity to the sober occasion. 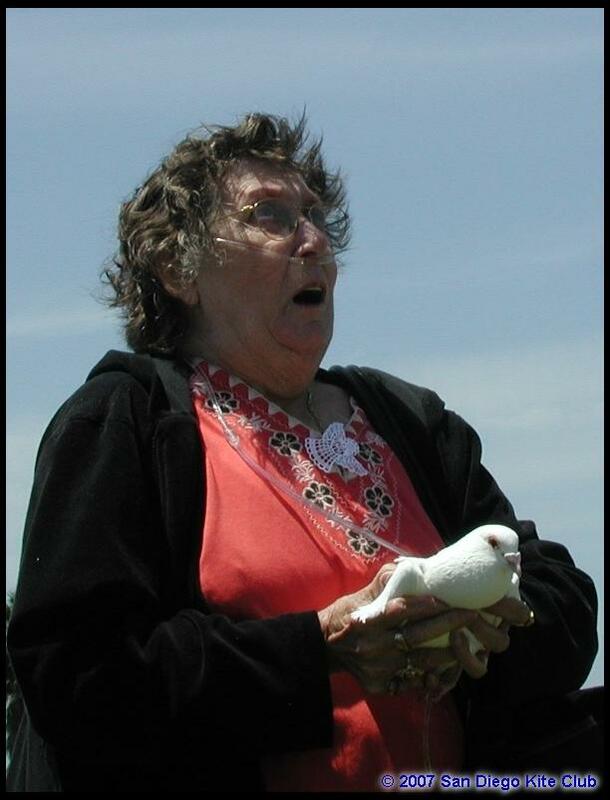 He had carefully planned what he was going to say but instead he just said “Thanks Charlie!” After the family released the birds, a big wicker basket containing 20 doves was to be opened in memory of others. One bird that was not totally white-having a gray feather on either side of his tail got out early, walked up & down, bobbing his little head & looked up at all the people as if to say “thanks for coming”, “glad to see you”, etc. He then flew up, all the birds circled overhead before grouping to fly home. I said that one represented Charlie. One friend picked up a single white feather off the field and handed it to me and said “Charlie is sending you a message”. Needless to say, I kept the feather. There were a lot of hugs and it is the type of celebration Charlie would have liked. 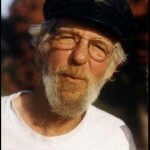 He didn’t want a conventional service and his ashes will be scattered in Bryce Canyon. Shaun had promised him many years ago that he would do that but there are some people that wish to join him for the trip. I’m doing OK. I think it was some help that he spent 6 months of the last year in the hospital & in a hospital bed at home. I was glad that he had a few months between the hospitalizations. He was a very unique individual & will be greatly missed. I don’t know if you ever heard him say it but when he would compete he always said regardless where he placed, “I won, I had the most fun”. Bless you Charlie, thank you for all of the color you brought to us, and for the encouragement you always provided to the youth in kiting… At Joanne’s request, I’ll be dedicating a demonstration at this years WSIKF, flying my Revolution to Neil Diamond’s Hell Yeah. I’d never heard the song before, and I’ve gotta say… That’s Charlie. This entry was posted in 2007, Issue 55 (Jul/Aug), KL Archive and tagged charlie mcclary, people.